Zenaida was one of our first residents to move into her new home at Mercy Othello Plaza. 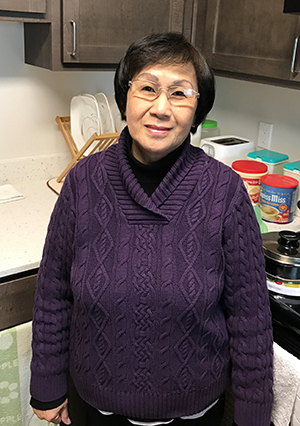 She arrived within the first week of the property’s opening on March 27 and has been more than grateful for the opportunity to settle in her new home. Zenaida describes her touching story of finding an affordable home as “God sent.” Before her move, Zenaida was caring for her older sister, who was ill. Her sister had to move into a rehabilitation center since her condition gradually worsened. Zenaida, whose only income stemmed from Social Security benefits and caregiving for her sister was left out on the streets. Luckily, a family who Zenaida was babysitting for, provided her with a place to stay until she got back on her feet. Zenaida contacted her former caseworker, who helped her apply for SSI back in 2010. The caseworker, who is now retired, kept in touch with Zenaida over the years and they remained friends. At the time Zenaida was in need of a home, Mercy Othello Plaza was still under construction. Even though she was hesitant, she applied with the encouragement and assistance of her trusted friend and caseworker.